The Organic Research Competitors report is great for identifying the main websites that a domain is competing with for organic search engine traffic. Get started by entering your domain or the domain of a competitor into the search bar. SEMrush will then populate a list of domains that rank for the same organic keywords (and therefore the same organic search traffic) as the domain you’ve queried. 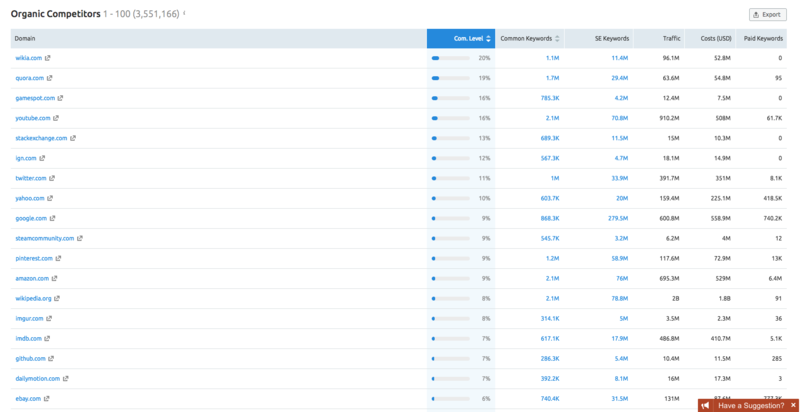 Much like the Positions report , the first thing you’ll see listed will be the number of keywords, estimated monthly traffic, and the estimated cost of that traffic. Below these numbers will be a unique graph displaying the main competitors of the domain according to their number of organic keywords and traffic. Scroll down in the report to see the complete list of domains that are competing with the domain you queried. The domains will automatically be ranked by Competition Level, which is based on the analysis of the number of keywords of each domain, and the number of the domains’ common keywords. The more keywords two domains share in common, the more likely they are to compete with one another. While the report automatically sorts by Competition Level, you will also have the ability to sort by the number of Common Keywords between the two domains. The reason you may see a difference between these two sorting orders is that sometimes two websites could have a high number of keywords in common, but not a similar level of overall keywords. At the top right of the page, you’ll see a button that says PDF. With this option, you’re able to export the entire report to a PDF which can be emailed, scheduled, or branded with a logo. You can also export the list of competitors by clicking the export button at the top right of the list of competitors. Once you've identified your top competitors, you can compare keyword sets side by side with the Keyword Gap tool. To compare traffic estimations between multiple sites, use the Traffic Analytics tool and benchmark multiple competitors side by side.